Is this excessive or is this pretty much what all dog owners have? Food toys - I feed all meals in some form through these toys. Some require supervision or they will be destroyed. Others sit around and act as chew/play/redirection items. 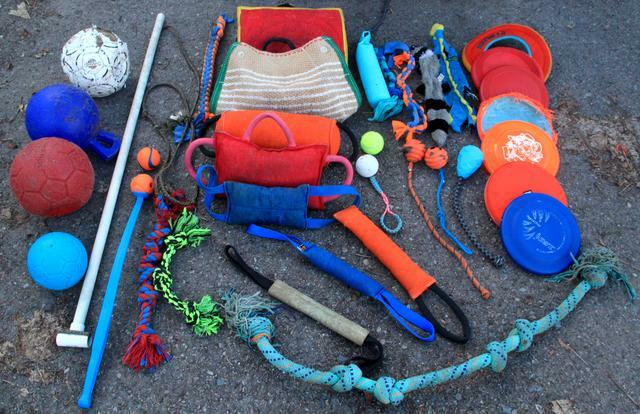 Interactive/Play toys - Only available when playing or training with me, usually outside. Every single thing here is very high value for Brae. Last edited by Canyx; 04-14-2019 at 07:31 PM. That sure is a lot! No, we don't have that many, haha.. I don't have that many chews due to my high maintenance teeth breakers. They basically only get bully sticks. But we did have a huge box of toys for a long time. We had a whole year of bark box and rotated toys as they arrived. Kinda running low now though.. as they slowly destroy them all. I let Brae destroy a toy once at ~2 yrs of age, pretty much around Xmas, and then he started nibbling on a random towel on the floor, picking at the nubs on his training mat, and potentially carrying paper around (three pieces of paper, which may have dropped on the group, were found on his dog bed with two teeth indentations. No shredding). None of this was obvious, highly destructive, or blatant. But none of this happened (beyond infant puppy stage) for 1.5 years. But Brae's an antsy dog who is always looking for SOMETHING to do, so I feel like if I continued to let him disembowel appropriate things he may be too happy to generalize the behavior to inappropriate things. Oh well. That's why none of his toys are the Petco/Petsmart, colorful, destructible, approachable looking toys. I've experimented a ton with chews, but Brae's much less food motivated and much more of an appropriate chewer than Sor ever was. So Nylabones and antlers are okay. But things like hooves and ribs are not; too thin. And even that is only an issue because he will regurgitate any fragment larger than a chicken neck bone - not a problem medically but a pain for me to clean. He's even doing this new thing with pig skin rolls... He used to really enjoy them but now he won't touch them unless I treat it like a stick and play with him for a few minutes, give him a ton of encouragement, then he will eat it in one sitting. If I don't do these steps, the pig skin roll may just sit on the floor for hours and he'll even go to sleep rather than take it. LOL, that's a lot of toys! Ralphie has a big box of inside toys, and a bunch of tug ropes and rubber toys that stay outside. He doesn't generally tear apart stuffed toys, which are his absolute favorite. They do eventually fall apart just from repeated use and Ralphie shaking them and carrying them around, but he does not try to intentionally destroy it. He destroyed ONE stuffed duck intentionally by disembowling it when he was around 9 months old, but after he watched me take it away from him and throw it in the trash, never to be seen again, he stopped. Never a problem again. If a toy is ripped beyond repair, I actually have to make sure he is outside so I can throw the toy away without him getting that horrible upset puppy face! He also gets upset if I throw his toys in the wash, or if I have to sew seams back together! As for chews, he seems to favor nylabones. He does have one big antler that he picks up often, too, but nylabones seem to be his favorite. There are quite a few in his box, but he has one that he uses almost exclusively. He will tear every toy of his box to find it, and if it is under furniture he looks around and will sit and bark and whine until one of us comes to fetch it for him. He also sometimes brings his chews (both nylabone and the "meaty" chews we sometimes give him as special treats) to us and has us hold it for him while he chews! So weird! He will also sometimes "bury" special treats under blankets and pillows, which is really quite disgusting when you are going to sit down and touch a slimy pig skin or Himalyan bone. I have always let my big dogs play with stuffy toys and just clean up the mess if they pull them apart, never have had a problem till a little over a week ago when I had to take one of my smaller dogs in for major surgery to remove a piece of toy from her intestine and another toy from her stomach which caused a blockage. Had never ever seen her show any interest in playing with toys of any kind. I went out and gathered all the pieces that had been buried in the snow all winter and as much as the big dogs enjoy playing with the stuffies I am not giving them any more. They still have several toys to play with that have been around for years and never destroyed. They have a couple of those balls that have little bumps on them and a squeak that they chase if I throw them but don't seem to chew on them and a few tough toys that they play a lot with and have lasted, will just keep an eye on them, so they are not deprived of toys but not near as many as Canyx. That's probably twice as many toys as we have for our 2 big dogs. Mind you our dogs will destroy any toy that they can, so most don't last very long. In the upper category I only have the white nyla bone as it is the only store bought chew thing thing that I have not heard of a dog breaking any teeth on. Antlers, cooked bones, horns, etc. are only given to puppies and not to dogs with adult teeth. I replace all of these with Raw non weight bearing bones. Treat dispensing toys I only use a Kong with frozen raw food or frozen plain Greek yogurt. The star mark green balls we run paracord through and braid it for a reward ball. Dog never gets a ball other than when working. Too many dogs lost choking on a ball (recently one of the best was lost this way). I currently use a different ball from Gappay.. this dog likes a harder ball. In the last the only one I have is Jolly Balls. I never let the dog have one alone.. and for the simple reason that doing so he started to wear his teeth down (indoor kennel in winter). Tugs and so forth, especially pillows, are for the helper to use, not me and we try to keep handler work and helper work separate. One thing I do not see here is a soft toy. I have this bear and duck made out of corduroy from Orvis that my older dog just loves. She carries one around and shakes it. She also picks it up if someone comes to the door and I let them in. She is a bit nervy and unloads on the toy after I tell her to lie down on her bed. 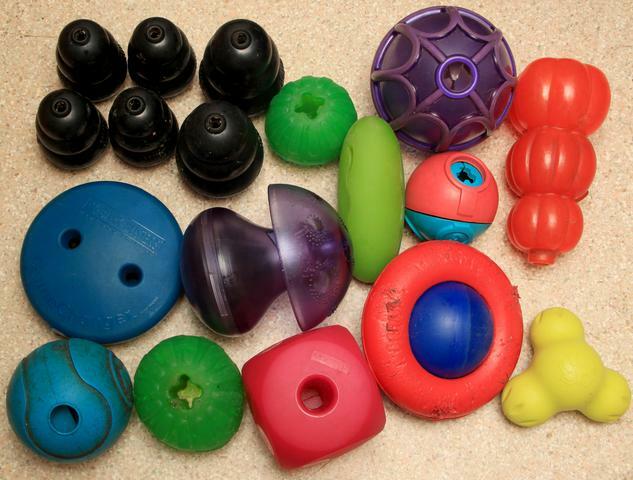 You have more than two dogs and it is not unreasonable to have a variety of toys and rotate toys. Yeah, I used to have a much more regular toy collection, like a selection of toys from big box pet stores. Sor was very 'regular' around toys... 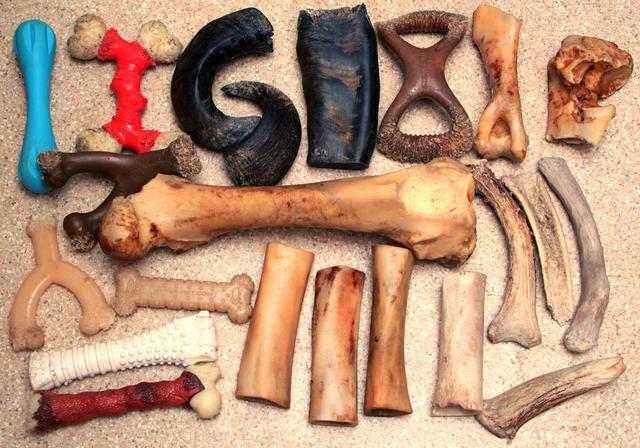 Loved tug, loved squeakies, loved disemboweling, but never ate anything plastics or cloth. I'm not morally against things like that and I think it's endearing when dogs rip stuff up or bury them, I just don't have a dog I can be lax about that stuff with right now. I actually just have one dog right now. Soft toys that I own are the small section in the upper right of the interactive toy photo. Mostly fleece tugs and skineez-type toys. I don't use them frequently because he prefers tugs with a lot more resistance. But I like the thin fabric tugs at times because they are easy to put in my pocket - easy reward to carry. Nice collection you got there! I like to periodically go and buy several toys at a time but don't think mine have that many total as some get ruined. Toys... toys and more toys..